Workers sort potatoes in the field, collecting small and large ones in different buckets. Each bucket weighs 30 pounds or so. A worker will shoulder that bucket and dump it into a flatbed truck 400 to 500 times a day. It's a daily load of 6 or 7 tons of sweet potatoes. Jimmy Burch Sr., in his office at Burch Farms, in Faison, N.C.
Nabor Segundo, with his infant, son, Alan. He and his family share this two-bedroom trailer with one other family. Workers carry buckets of sweet potatoes to a waiting truck. Buckets of sweet potatoes go into bins on a flatbed truck. There's an oil painting on one wall in the cluttered room that serves as central headquarters of Burch Farms, a large vegetable grower in Faison, N.C. The painting shows an African-American couple, the woman in a long, plain dress, the man in a homespun shirt. They're digging sweet potatoes with their bare hands and an old-fashioned hoe. Jimmy Burch Sr., who owns the business together with two brothers, says that when he saw this painting, he had to buy it — partly because he grows sweet potatoes himself, and partly because this crop has been such a big part of Southern culture. The sweet potato "was easy to grow, relatively. We had the right climate for it. And it was cheap!" he says. "All the rural people, farmers, that's what they ate all winter. That and collard greens. I mean, sweet potatoes and collard greens are a big deal in the South. It don't get more traditional than that!" Now traditional is trendy. The humble sweet potato, after decades of decline, is making a comeback. People have woken up to the fact that its orange flesh is full of nutrients. "Anything with vitamin A, they're buying the hell out of it," he says. "And they need to! Because it's good for you!" Sweet potato production has doubled over the past 15 years. In North Carolina, it's tripled. 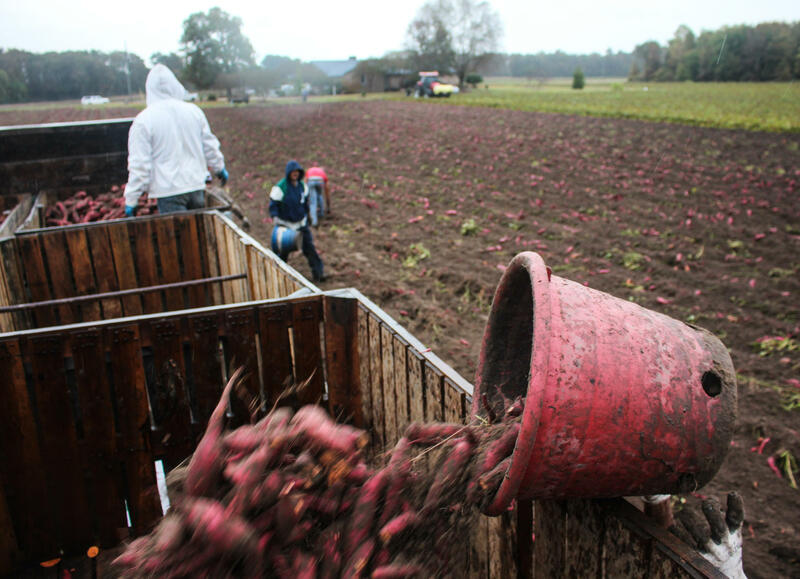 North Carolina now produces just over half of all the sweet potatoes in the country. This year, Burch Farms has a monster crop, the biggest ever. Jimmy Burch's problem, on this day, seems to be running out of wooden pallets and bins to store them all. He keeps making phone calls, trying to find more. "I mean, it's a good thing, don't get me wrong. The Lord gave me a good crop, and I'm gonna dig 'em. I'm going to get them in the house, somehow or other." But digging this crop takes many hands. As Jimmy Burch puts it, "a world of people." People like Nabor Segundo and his wife, Rosalia Morales. I meet them early in the evening at their home in a small trailer park that sits along a country road amid the fields east of the town of Mount Olive. They and their infant son, Alan, share this two-bedroom trailer with one other family. All together, four adults and four children live here. Segundo and Morales met each other a few years ago, in Florida, picking peppers. "We saw each other and fell in love," Segundo says, and both of them start giggling. The couple spends about half of each year in Florida. But for about six months in summer and fall, the work is here, in the coastal plain on North Carolina. That's actually a relatively long time for migrant work. They can stay here that long because they switch back and forth between sweet potatoes and another labor-intensive crop: tobacco. The tobacco work is now finished. It's the end of the season. All that's left to do is bring in the sweet potatoes. In every sweet potato field, the work is similar. A tractor does the first part. It pulls a set of steel disks through the vine-covered field, turns the soil upside down, and exposes a bounty of sweet potatoes. The rest is done by hand. The skin on a fresh sweet potato is too fragile for machinery. 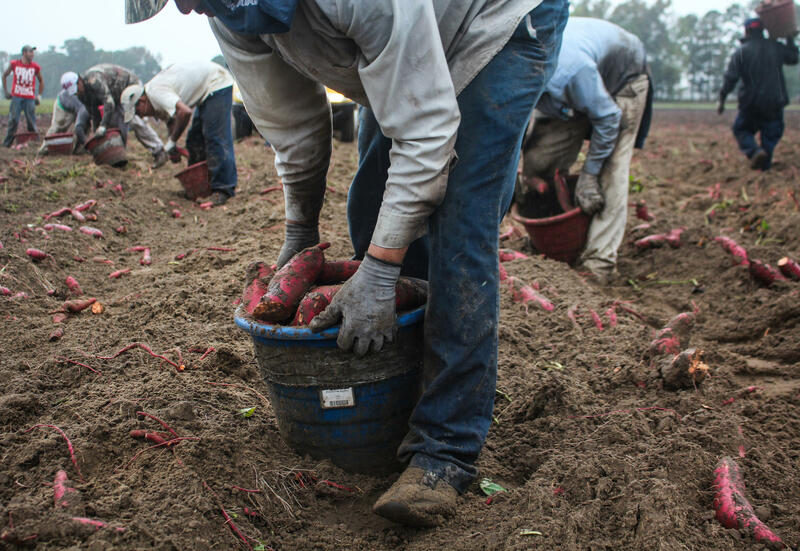 Men — and a few women — move through the field, backs bent, picking up sweet potatoes and dropping them into plastic buckets. When the buckets are full, the workers lift them to their shoulders, carry them to a flatbed truck, and dump them into bins. It's exhausting work — some of the most physically demanding farm work there is. "When you first get here, your waist, your hands and your feet can't take it," Segundo says. "It's really hard the first time, because you don't know how to carry the bucket, how to lift it to your shoulders. It's really hard to learn." Segundo says each bucket weighs 30 pounds or so. He fills that bucket, and carries it to the truck, 400 to 500 times each day. It's a daily load of six or seven tons of sweet potatoes. At 50 cents a bucket, it adds up to a daily wage of $200 or $250. That's on the days the laborers are working. On the day I was there, it was raining, so they earned nothing at all. From this field, the sweet potatoes, still caked with dirt, go into huge, climate-controlled barns for storage. They will sit there at least for a few weeks, because sweet potatoes improve with a bit of age. The skin becomes less fragile. They also get sweeter: Some of their starch turns into sugar. Meanwhile, the farm workers who pulled them from the soil move on to other fields, and other kinds of food. A few days before Thanksgiving, a bumper crop of sweet potatoes has made its way to supermarkets and kitchens across America. It's a holiday tradition with roots and recipes from the South, and lifting those plump roots from the soil is backbreaking work. 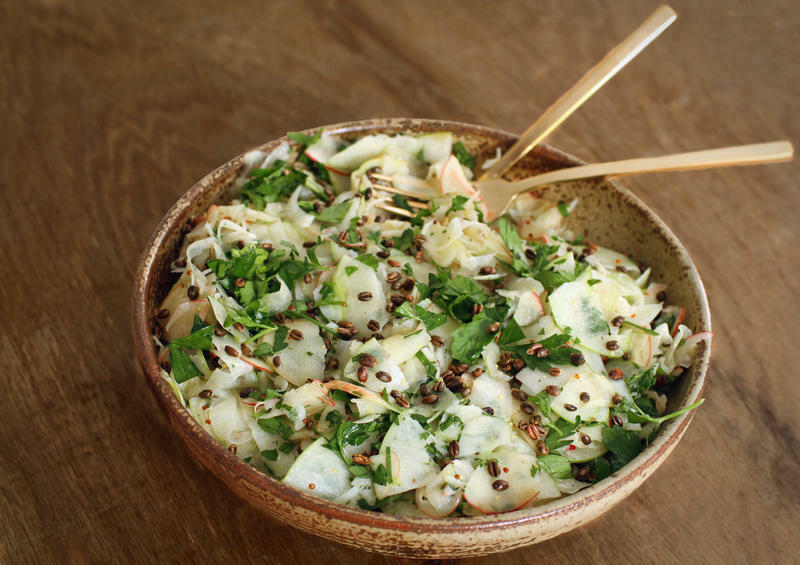 As part of our occasional series about foods of the season and the people behind them, NPR's Dan Charles has this story. DAN CHARLES, BYLINE: There's an oil painting on one wall in the cluttered room that serves as central headquarters of Burch Farms in Faison, N.C. It shows an African-American couple - the woman in a long, plain dress, the man in homespun shirt - digging sweet potatoes with their bare hands and an old-fashioned hoe. Jimmy Burch, Sr., who runs the sales operation here, says when he saw that painting, he had to buy it because the sweet potato's been such a part of Southern culture. JIMMY BURCH: It was easy to grow, relatively. We had the right climate for it. And it was cheap. All the rural people, farmers, that's what they ate all winter long. That's what they lived on - that and collard greens. I mean, collards and sweet potatoes are a big deal in the South. You don't get no more traditional than that. CHARLES: But the traditional is now trendy. The humble sweet potato, after decades of decline, is making a comeback. People have woken up to the fact that its orange flesh is full of nutrients. BURCH: Anything with vitamin A, people are buying the hell out of it. And they need to because it's good for you. CHARLES: Production has doubled over the past 15 years. In North Carolina, it's tripled. North Carolina now produces just over half of all the sweet potatoes in the country. And this year, Burch says, he has a monster crop - biggest harvest on record. His problem on this day seems to be they're running out of wooden pallets and bins to store them all. He keeps making phone calls, trying to find more. BURCH: I mean, it's a good thing, don't get me wrong. I mean, you know, the Lord gave me a good crop. I'm going to dig them. I'm going to get them in the house, somehow or another. CHARLES: But digging them, gathering them, takes many hands - as Jimmy Burch puts it, a world of people. People like Nabor Segundo and his wife, Rosalia Morales. I meet them early in the evening at their home in a small trailer park that sits along a country road amid the fields. CHARLES: They and their 10-month-old son Alan share this two-bedroom trailer with one other family. They met each other a few years ago in Florida, picking peppers. NABOR SEGUNDO: (Through interpreter) Yes, we met at work. We saw each other, and we fell in love. CHARLES: They spend about half of each year in Florida. But in summer and fall, the work is here, in the coastal plain of North Carolina. SEGUNDO: (Through interpreter) Up here in the north, we're only here for six months. CHARLES: That's actually a long time for migrant work. They can stay here that long because they switch back and forth between sweet potatoes and another labor-intensive crop - tobacco. The tobacco is done now. It's the end of the season. All that's left to do is bring in the sweet potatoes. In every sweet potato field, the work is pretty much the same. A tractor does the first part - pulls a set of steel discs through the vine-covered field, turns the soil upside-down and exposes a bounty of sweet potatoes. The rest is done by hand because the skin on a fresh sweet potato is fragile - too fragile for machinery. The men and a few women move through the field, backs bent, picking up sweet potatoes and dropping them in plastic buckets. When the buckets are full, the workers lift them to their shoulders and carry them to a flatbed truck and dump them into bins. It's exhausting work - some of the most physically demanding farm work there is. SEGUNDO: (Through interpreter) When you first get here, your waist, your hands, your feet - they can't take it. It's really hard the first time, because you don't know how to carry the bucket, how to lift it onto your shoulders. It's a lot. It's really hard to learn. CHARLES: Nabor Segundo says each bucket weighs 30 pounds or so. He fills that bucket and carries it to the truck four or five hundred times each day. That adds up to six or seven tons of sweet potatoes. At 50 cents a bucket, it's 200 or $250 in his pocket. From this field, the sweet potatoes, still caked with dirt, go into huge climate-controlled barns for storage. They have to sit there at least a few weeks because sweet potatoes improve with age. The skin becomes less fragile. They also get sweeter - some of their starch turns into sugar. And the farm workers who pulled them from the soil move on to other fields and other kinds of food. Dan Charles, NPR News. Transcript provided by NPR, Copyright NPR. For those who like to try new recipes at Thanksgiving, let Clay Dunn and Zach Patton be your guides. They're the couple behind the food blog, The Bitten Word, and every year before the holiday, they scan 10 leading food magazines to identify recipe trends. Mack’s Apples Farm in Londonderry is changing ownership to the next generation of the Mack family. Owner Andrew C. Mack says he’s passing on the farm to his son, Andrew Mack Jr. and his wife Carol Mack. This will be the eighth generation of the Mack family to run the farm, going back to 1732. It’s the oldest family-run farm in New Hampshire.